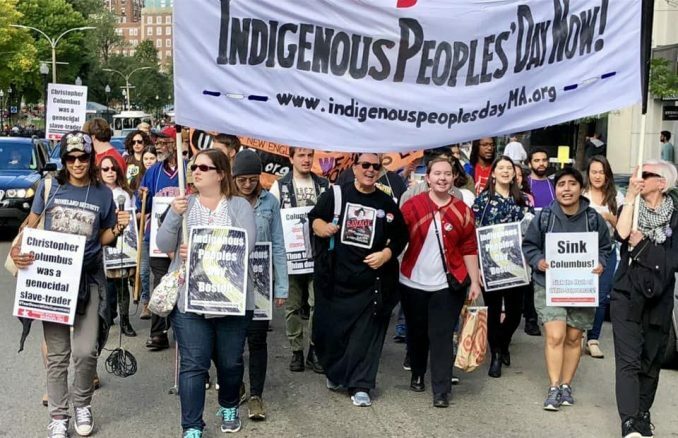 About 150 people participated in an Oct. 6 Boston rally and march demanding the city government end its celebration of Columbus Day and instead fully recognize the second Monday of October as Indigenous Peoples Day. 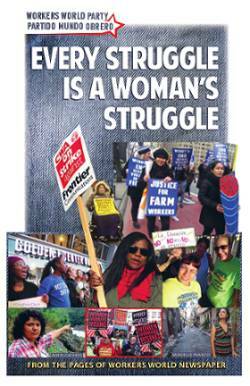 After a rally near Boston Common featuring Indigenous and Black speakers, the protesters marched to the nearby Ritz-Carlton, Boston, one of seven Marriott-owned hotels in Boston where UNITE HERE Local 26 workers are on strike. The Indigenous Peoples Day protesters joined the picket line to show solidarity and were met with great enthusiasm by the striking workers. Chanting “City by city, town by town, We’re gonna tear Columbus Day down,” the marchers continued to a Christopher Columbus statue guarded by Boston cops. Later that afternoon, signs were hung on the statue stating that Columbus was a genocidal slave trader who should not be honored. After speakers bore witness to the destructive and painful settler colonialism experienced since 1492, demonstrators turned their backs on the statue and faced Boston Harbor. They spoken about how “Water Is Life” for everyone and called out blessings to the water, each in their own language. The Indigenous Peoples Day action was called by United American Indians of New England and IndigenousPeoplesDayMA.org.